In December of 2009 I broke my leg. A complete fracture of my right tibia and fibula. It was not fun. It happened at our family Christmas Party, with over 200 people there. It was not fun. This break changed my life. Because of this break I got to sit at home, in bed, for the entirety of the winter. That’s right, whilst my friends ventured out into the frozen terrain of Clarks Summit, PA, I was snuggled up in a blanket all day and all night. This also gave me time to read. What better way to spend my time than a 700+ page book about professional basketball? 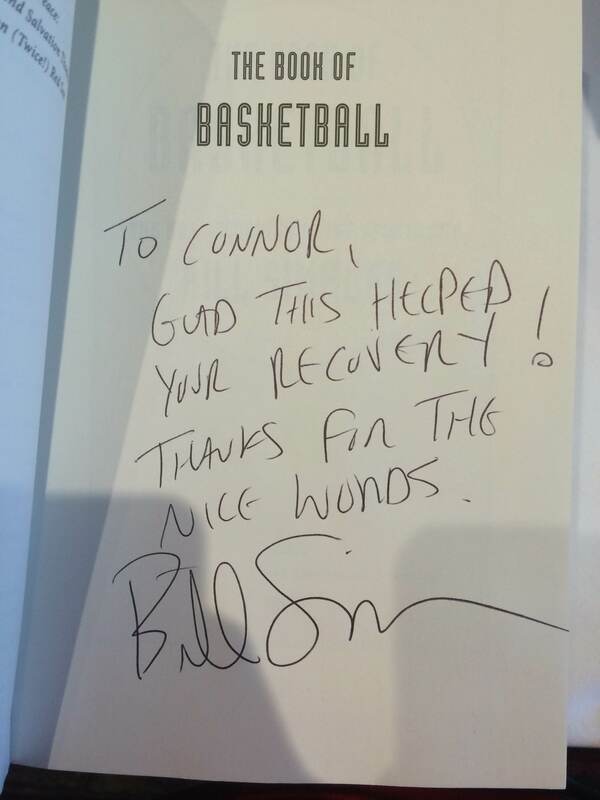 I heard an ESPN Radio interview with Bill Simmons one morning when my dad was driving me to school and heard him describe The Book of Basketball. I was intrigued. Rankings, stories, hypotheticals – it had everything I liked. So with this newly fractured leg and nothing better to do, I read it all. I plowed through the book. Then I plowed through as many Bill Simmons classics from the decade before as I could. By the end of this all he was my favorite writer of all time. In the years that have followed I have never missed a Simmons column. I read Grantland, his website stemming from ESPN, daily. Hell, I think I can count the number of days I haven’t logged onto Grantland in its three year existence on just over one hand – and I was either in the hospital or out of the country when it happened. 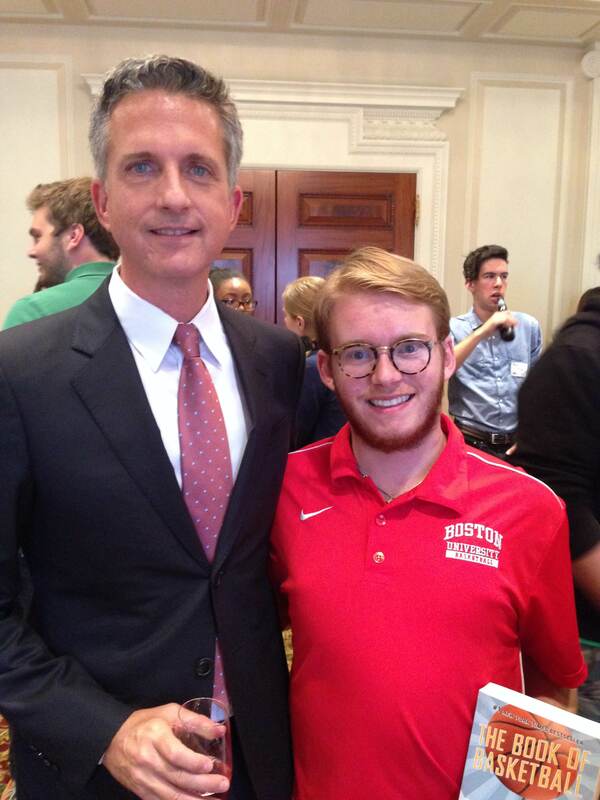 Out of anyone on Earth that I could choose to meet, it would be Bill Simmons. He is the reason you are reading this right now. He is the man who inspired me to start writing. He is the man who indirectly helped me find my voice as a writer. He is the man who has changed my life more than anyone that I’m not related to. I found out a few weeks ago from a sign in the front of the College of Communication building at Boston University that Simmons was set to be honored as a Distinguished Alumni on September 18th. I also found out that I was allowed to go. I won a prize from the COM offices of a copy of The Book of Basketball. It was waiting for me tonight. I held it tight and routinely checked the door. Then I saw him walk in. He stood across the room from me while I was in a combined state of panic, amazement, and shock. I couldn’t move. Someone tapped him on the shoulder to point out my book. I proceeded to tell him an abridged version of the story above. I thanked him from the bottom of my heart for creating the book that not only helped me in a time of need, but gave me a direction to live my life. He signed the book for me. And then we took a photo for the COM Twitter account. I thanked him and returned to excitedly giggling. It’s a rarity that you’ll ever get to meet your hero, your inspiration, in person and thank them for what they have given to you. Tonight I got to. I’m not sure anything will ever top this. How can you really top it? I met my hero.